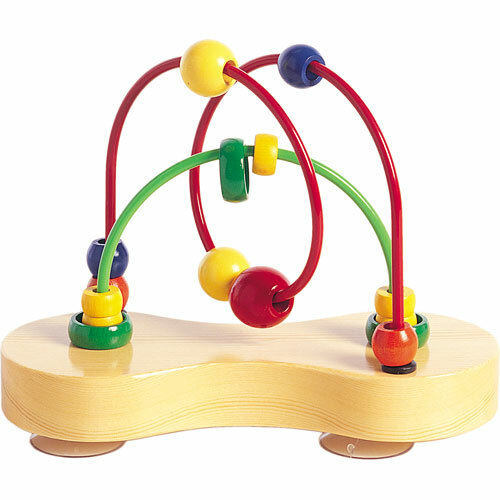 Four sturdy suction cups secure the solid wooden base of this early learner maze to virtually any smooth surface. 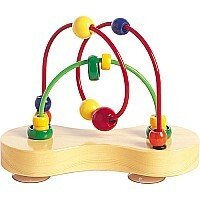 The simple loops and colorful curves engage the eyes and stimulate interactive play. Nesting beads demonstrate the concept of "inside/outside" and offer peek-a-boo fun. No removable parts. Dimensions: 9" x 4" x 7"
Hape toys are designed first and foremost for children. Each product is developed to enhance a child’s developmental skills, as Hape believes that the future begins and belongs to our children. Our toys are created to inspire play, learning, and exploration of the world we live in; through responsible business practices we aspire to leave the world in a better condition than when we received it.